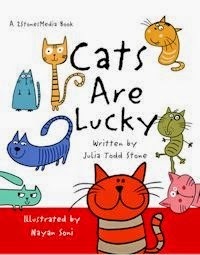 If you are a cat person, then you don't want to miss Cats are Lucky by Julia Todd Stone and illustrated by Nayan Soni. It is a very cute picture book that starts with a simple premise: "Once upon a time, a beautiful collie was pondering the funny ways of cats. . ."
After this collie sees all things cats can do, including being able to sleep anywhere and hide in a mailbox, he realizes that maybe being a collie is just what he is supposed to be after all. Cats are Lucky is a little book with a big message that kids of any age will love. 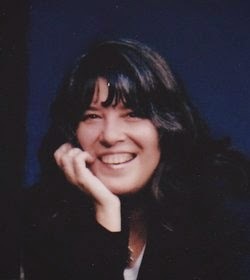 We are lucky enough to have an interview with the author, Julia Todd Stone. So here we go. . .
WOW: Welcome, Julia. How did you get the idea for Cats are Lucky? Julia: I was looking at a picture of my dog Lassie and me when I was two years old. And then I started wondering what she might have thought about cats. Then I remembered a funny cat picture I saw on the Internet. So I thought if we had an artist create funny illustrations about cats that people might like it. It was easy to think up ideas by remembering funny things I’ve seen cats do in my 50 years of living. For some reason, I didn’t think of an obvious one: a cat climbing a sheer curtain, so I had a new picture made and it’s in the latest edition of the book. WOW: I love the illustration of the cat and the fish bowl. It is perfect! Who is the perfect audience for this book? Julia: At first I thought it would be children, but it turns out that adults are enjoying it, too. Accordingly, some had said that it reminds them of a pet they had when they were young. WOW: I can see cat lovers everywhere enjoying this book! For such a short book, it sends a powerful message about self-esteem in a fun way. Why is it important to teach kids to be happy with themselves? Julia: I believe it is important because when they grow up they will have to find a way of being happy with themselves. My husband is a prime example of this. His childhood was less than perfect, and so today, he struggles to find true happiness. Even today he’s trying to find acceptance from his mother, and this book has helped him, or so he says. Hopefully it will help others with the same plight. WOW: That is an amazing story about your husband. Tell us about your illustrator. What fun pages in this book! Julia: Thank you! Nayan Soni, nayansoni.com, is from Ahmedabad, India. I connected with him using Elance, which acts as a conduit between workers and people who need jobs done. It took a while to find him, but when I saw his portfolio I knew he was the perfect man for this job! His illustrations are simple but beautiful and funny. And because the illustrations were so simple they fit. He was a dream to work with, and I never had to ask for a correction or re-do. All I told him was like, “This picture will be called ‘They can sleep anywhere,’ so please draw two towel bars, one of which has a towel on it and one of which has a sleeping cat on it.” And then a day later he would send just the right picture. Nayan has illustrated many children’s books and can also do animated cartoons. I recently commissioned three new illustrations because I thought that the Collie’s epiphany happened too abruptly, and the new illustrations will be published. It’s wonderful that you can republish your book within a 24-hour period! WOW: Where can interested readers find your book? Julia: It’s available exclusively at Amazon right now, and it’s made for the Kindle eBook reader. As you know, Amazon provides free apps that lets anyone read Kindle eBooks on phones, tablets and PCs, so readers don’t need a Kindle to read my book. And if they’re a member of Kindle Unlimited, they can read the book free of charge! WOW: Yes, Amazon makes it easy to read books! I have to ask: are you a dog or cat person or both? Julia: I’m a dog person, but I love watching cats do crazy stuff. Thank you for this interview! Muffin readers, check out Cats are Lucky on Amazon now! What a great idea for a picture book! I'll have to check it out. Thank you Margo and Julia for the fun interview. I often do wonder what each of my dogs and cats are thinking, especially about each other.